We are very close to importing fully working levels back to Oni. Doors and consoles work, pathfinding grids are automatically generated, patrol paths work. For cutscenes to function, it will require a lot more manual work on our part to get all the pieces together. (OBANs, M3GMs, FILMs and so on) There does not seem to be a way to automate this process. 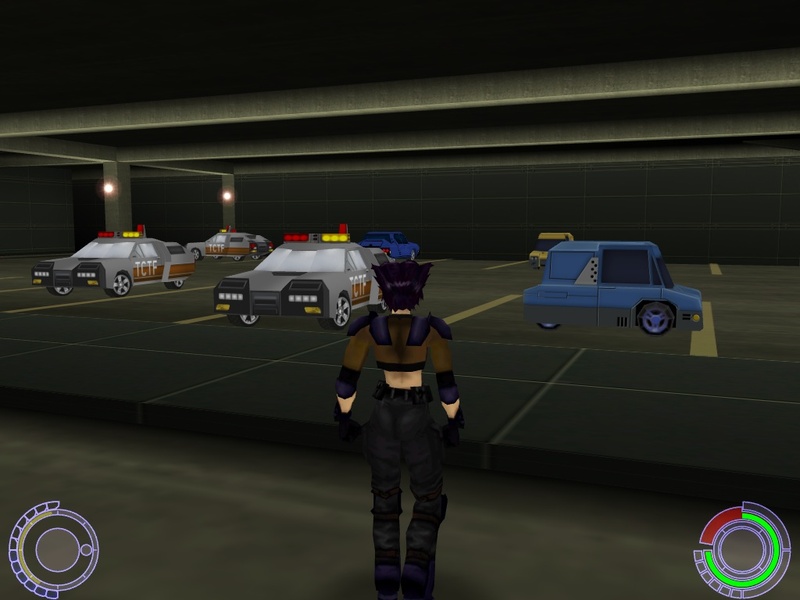 As you can see in the screenshot, I added more cars to the parking lot in TCTF headquarters. (Though some people can't park their cars right). Place the latest OniSplit and the tools folder in the Edition/install folder. Inside the tools folder you will find classes which holds all the door and console types and OBAN files for the doors, OFGA and their related M3GM and TXMP files. There is also a sample tctf folder with some of the files needed to import the level. This is where you enter the name of the env and bnv file of the level. <Sky>sunset</Sky> What type of sky you want. You will need to extract AKEVtctf from the level8_Final folder inside the GameDataFolder, put all the files (tctf_env.dae, tctf_bnv.dae, tctf_obj.dae, grids, images and markers folders) into the env folder. This will create an out folder inside the tctf folder with all the .oni files. Move all the files from the out folder into the level8_Final folder. Before you do this, make a copy of the level8_Final folder, so you will always have the original files, in case something goes wrong. If you want to modify a different level, the process is the same. 1) Make a new folder inside the tools folder, for example "lab". 2) The structure of the new folder should be the same as tctf. 3) Extract from the level folder all the BINACJBO files as .xml and the AKEV file as .dae. 4) Make a control xml file, follow the structure of the tctf.xml file. Position: x,y,z coordinate of the object. Rotation, the direction it will be facing and Class, the name of the object. In the classes folder all the objects that can be added to a level are called OFGA. so OFGAV_tctf_cruiser in this example. For example, open the AKEVtctf_env.dae file in your favorite 3D program such as Mod Tools, Blender, Sketchup, etc (Note: Sketchup sometimes will fail to import a level's environment, I don't know why). Make the changes you want, if you added more areas, the bnv needs to be modified, so you can have pathfinding grids in the new areas. Note to Mac users, download this filehttp://edt.oni2.net/OniSplit/agdb.zip and put the AGDB file which corresponds to the level into the levelx_Final folder. For example put AGDBtctf.oni in level8_Final folder. This file is in the PC version and helps OniSplit when extracting a level. Once you have modified the environment, export it as dae, put it in the env folder and use the command again -create:level. If all goes well, you will see your modified level in game! This is just a basic workflow, I have not done any modifications to an environment. (Though some people can't park their cars right). Looks cool! Seems we will even be able to improve original levels. "New car, caviar, four star daydream, think I'll buy me a football team." I think the developers could do many things they promised but they didnt cause the games release was rushed. Yes, and much of what we're doing here is just recreating the abilities of the Bungie team. But they could have done a lot more with another six months or a year. The BINACJBOFurniture file is used to place objects through the level. The objects are know as OFGA. OFGAElement links to the M3GM and the flags for the object. The object can be made up of multiple parts. This tctf cruiser is composed of 8 parts. The last element is basically a box around the entire car. An example will be posted later. 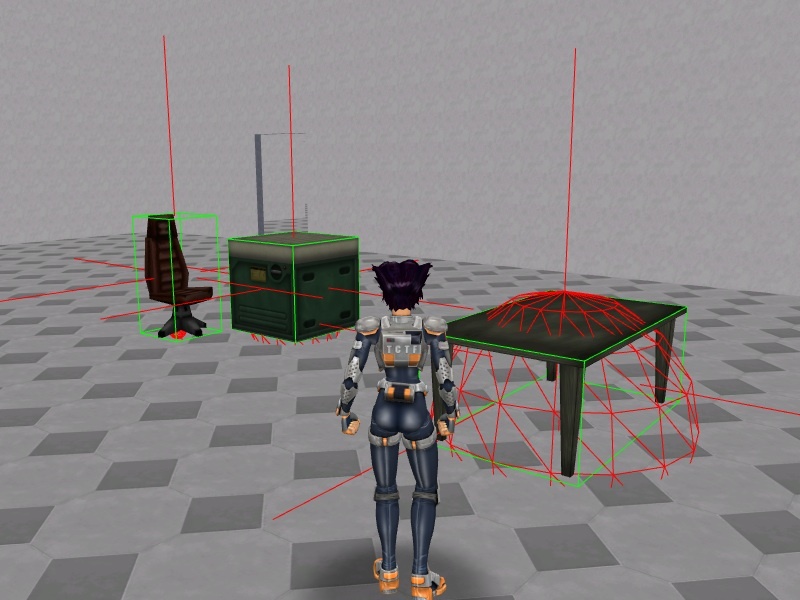 Moveable furniture was one of the features mentioned in Oni, however, it was removed before its release. However, we can now implement it to a limited degree, due to Oni's physics engine. We can push things around, but cannot jump on them, you will fall through the object. Sometimes collisions work, other times they don't. Object Name: needs to be unique, ScriptId: unique number, Geometry: OFGA name, Position x,y,z coordinates, Rotation: angle of facing. In the control file add the link <Import>out/physics.xml</Import> inside the Objects tag and place the physics.xml file in the out folder. It shows the bounding box and collision sphere. For some unknown reason the collision sphere for the chair is very small. First post updated with files and instruction on modding an existing level, have fun! Added the instructions for moveable furniture to the tutorial. I'm curious. Was it an unused feature left unfinished by the programmers or we just used the physics in a different way? With this we will finally be able to play furniture soccer. What a great day. New game mode for Flatline, how about that? Because its buggy and not useful for anything.